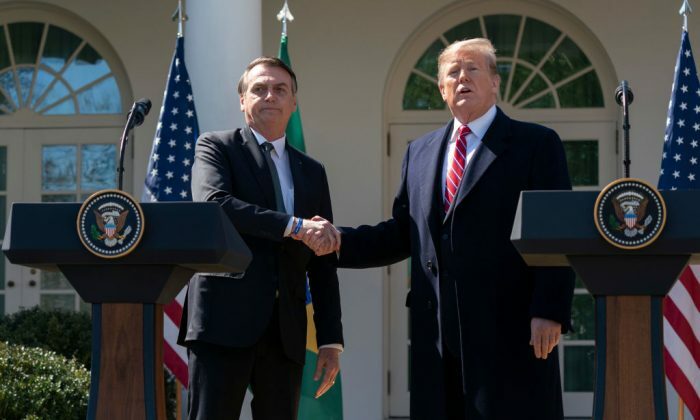 WASHINGTON—President Donald Trump hosted Brazilian President Jair Bolsonaro, who has been dubbed the “Trump of Tropics,” at the White House on March 19. After decades of anti-Americanism in Brazilian politics, Bolsonaro’s visit marked a new chapter in relations between the United States and Brazil. Both leaders said their policies were aligned on many issues, including Venezuela, security, and trade. Trump praised Brazil for recognizing Juan Guaidó as Venezuela’s interim president and supporting the United States in providing humanitarian aid to Venezuelans. During a joint news conference with Bolsonaro at the White House, Trump urged Venezuela’s military to end its support for socialist dictator Nicolás Maduro, calling him “a Cuban puppet.” In a joint statement, both leaders reiterated that they would stand with Guaidó, the democratically elected National Assembly, and the Venezuelan people. “I think that all possibilities, all options are open,” Trump said when asked about the odds of military intervention. “But we haven’t done the toughest of sanctions yet,” he said, adding that they may have to increase the sanctions against Venezuela. Both leaders spoke of being closely aligned views on values. “Brazil and the United States stand side-by-side in their efforts to ensure liberties and respect to traditional family lifestyles, respect to God, our creator, against the gender ideology or the politically correct attitudes and against ‘fake news,'” Bolsonaro said. Bolsonaro, who has often expressed his admiration for the United States and Trump, said he was happy to visit Washington, particularly after decades of “anti-U.S.” leaders in his country. Trump was the first foreign leader to call Bolsonaro to congratulate him on his election victory in October. The meeting between the leaders also marked many firsts in the relations of both countries. This is the first bilateral overseas visit of Bolsonaro, and it’s the first time in history that a Brazilian president has visited Washington as his or her first official overseas visit. “It’s an incredible recovery. The people of your country know that you’ve shown tremendous bravery,” Trump said. “I’ll have to talk to a lot of people but maybe a NATO ally, which will greatly advance security and cooperation between our countries,” he said. Trump also said the United States supports Brazil’s aspirations to join the Organization for Economic Cooperation and Development (OECD), a club of mostly rich nations. The two leaders agreed to work together in combating terrorism, narcotics and arms trafficking, cybercrimes, and money laundering, as well as enhancing border security. Bolsonaro announced Brazil’s intent to exempt U.S. citizens from tourist visa requirements. The United States had a trade surplus of about $27 billion with Brazil last year. Both leaders made commitments to reduce trade barriers and facilitate investment across a range of industries, particularly energy, infrastructure, agriculture, and technology. According to the joint statement, Brazil agreed to implement a tariff rate quota, which would allow the purchase of 750,000 tons of U.S. wheat annually at a zero rate. In addition, Brazil will allow the importation of American pork. After 20 years of talks, both countries are finalizing a technology safeguards agreement to allow U.S. companies to conduct space launches from Brazil. Because of its proximity to the equator, Brazil is an ideal location and will help save “tremendous amounts of money,” according to Trump. To improve business relationships, both countries agreed to revive the U.S.–Brazil CEO Forum and start a new U.S.–Brazil Energy Forum. A former military officer, Bolsonaro served for nearly three decades in Congress and became the president on Jan. 1. Many draw parallels between him and Trump. “There were a lot of people there with good manners and very bad principles. And the Brazilians understood that and vote massively for President Bolsonaro,” he said. “It was a disruption of social networks against the establishment, political parties, conventional media,” he said, adding that there were a lot of similarities between Trump and Bolsonaro. A former investment banker from Rio de Janeiro, Guedes is leading the reform of Brazil’s pension scheme and other economic policies. Brazilian stocks have broken records since Bolsonaro’s victory in October. The country’s benchmark Bovespa stock index rose more than 20 percent since the election, touching 100,000 points for the first time in its history. Growing optimism about Bolsonaro’s reform agenda has boosted Brazilian stocks. A half-dozen ministers joined Bolsonaro during his three-day visit to Washington.